Truth claims in the medical literature rely heavily on statistical significance testing. Unfortunately, most physicians misunderstand the underlying probabilistic logic of significance tests and consequently often misinterpret their results. This near-universal misunderstanding is highlighted by means of a simple quiz which we administered to 246 physicians at two major academic hospitals, on which the proportion of incorrect responses exceeded 90%. A solid understanding of the fundamental concepts of probability theory is becoming essential to the rational interpretation of medical information. This essay provides a technically sound review of these concepts that is accessible to a medical audience. We also briefly review the debate in the cognitive sciences regarding physicians' aptitude for probabilistic inference. While probabilistic considerations have always been fundamental to medical reasoning, formal probabilistic arguments have only become ubiquitous in the medical literature in recent decades [2, 3]. Meanwhile, many have voiced concerns that physicians generally misunderstand probabilistic concepts, with potential serious negative implications for the quality of medical science and ultimately public health [3–12]. This problem has been demonstrated previously by surveys similar to the following quiz , which we administered to a group of 246 physicians at three major US teaching hospitals (Barnes Jewish Hospital, Brigham and Women's Hospital, and Massachusetts General Hospital). The reader is likewise invited to answer before proceeding. Consider a typical medical research study, for example designed to test the efficacy of a drug, in which a null hypothesis H 0 ('no effect') is tested against an alternative hypothesis H 1 ('some effect'). Suppose that the study results pass a test of statistical significance (that is P-value <0.05) in favor of H 1. What has been shown? H 0 is probably false. H 1 is probably true. The answer profile for our participants is shown in Table 1. This essay is for readers who, like 93% of our respondents, did not confidently select the correct answer, (7), 'None of the above'. We hasten to assure the reader that this is not a trick question. Rather, it is a matter of elementary probabilistic logic. As will be clear by the end of this essay answers (1) to (6) involve 'leaping to conclusions', in violation of the basic law of probabilistic inference, Bayes' rule. We will see that Bayes' rule is an essential principle governing all reasoning in the face of uncertainty. Moreover, understanding Bayes' rule serves as a potent prophylaxis against statistical fallacies such as those underlying the apparent plausibility of the six erroneous answers in this little quiz. Despite its central place in the theory of probabilistic inference, Bayes' rule has been largely displaced in the practice of quantitative medical reasoning (and indeed in the biological and social sciences generally) by a statistical procedure known as 'significance testing'. While significance testing can, when properly understood, be seen as an internally coherent aid to scientific data analysis , it is usually misunderstood as a way to bypass Bayes' rule, which we shall see is a perversion of probabilistic reasoning. Embarrassingly, fallacious uses of significance testing continue to flourish despite being under constant criticism in the statistical literature since its inception in the 1960 s [5, 13, 15–17]. The reasons for this state of affairs derive from a complex web of social and philosophical factors. However, we believe a more immediate barrier to physicians understanding probability theory is the lack of adequate literature explaining the subject in a way that physicians can relate to. Therefore, we have written this essay with three aims in mind. The first aim, addressed in 'Discussion, Part I', is to explain the basic concepts of probability theory to physicians, and in particular to provide a detailed account of the 'origin', mechanics, and meaning of Bayes' rule. The second aim, covered in 'Discussion, Part II', is to provide an accurate technical explanation of the two ingredients of significance testing: binary hypothesis testing and P-values. Finally, we aim to show how understanding Bayes' rule protects against common errors of statistical reasoning, such as those involved in choosing the wrong answers to our introductory quiz. if A is true, then B is true . A is true . ∴ B is true . if A is true, then B is true . B is false . ∴ A is false . 75 year old man with fever, productive cough, chest x-ray showing consolidation of the right upper lobe, sputum culture positive for gram positive cocci in clusters. 50 year old previously healthy man with sudden onset painful arthritis of the MTP joint of his right great toe, arthrocentesis positive for needle-shaped, negatively birefringent crystals. The reasoning required to make these diagnoses is essentially syllogistic, that is a matter of checking that the definitions of the disorders are satisfied, then drawing the inevitable conclusion. if A is true, then B is true . B is true . ∴ A becomes more plausible . 45 year old homeless alcoholic man brought in by police with confusion, disorderly behavior, and breath smelling of alcohol. Diagnosis: Ethanol intoxication. 75 year old nursing home resident with known heart failure presents with confusion and shortness of breath. Physical examination reveals rales, 3+ lower extremity pitting edema, labored breathing. Diagnosis: CHF exacerbation. 55 year old male presents to ED with acute onset substernal chest pain. Diagnosis: Gastric reflux. Most physicians quickly assign rough degrees of plausibility to these diagnoses. However, in these cases it is reasonable to entertain alternative diagnoses, for example in the first case other intoxicants, or meningitis; and in the second case pulmonary embolus, pneumonia, or myocardial infarction. In the third case the stated diagnosis is only weakly plausible, and most physicians would doubt it at least until other possibilities (for example myocardial ischemia) are ruled out. In each case, there is insufficient information to make a certain (that is logically deductive) diagnosis; nevertheless, we are accustomed to making judgements of plausibility. If A is true, then B becomes more plausible . B is true . ∴ A becomes more plaussible . If A is true, then B becomes more plausible . B is plausible . ∴ A becomes more plaussible . As in syllogistic reasoning, weak syllogistic reasoning combines prior knowledge (for example knowledge of medicine and clinical experience) with new data (for example from seeing patients, lab tests, or new literature), but the knowledge, data, and conclusions involved lack the certainty required for deductive logical reasoning. The practice of formulating differential diagnoses, and the fact that physicians do not routinely test for every possibility in the differential, shows that physicians do in fact routinely assign degrees of plausibility. The same can be said of most situations in everyday life, in which the ability to judge which possibilities to ignore, which to entertain, and how much plausibility to assign to each constitute 'common sense'. We now explore the rules that govern quantitative reasoning under uncertainty. The plausibility of A ( without regard to B ) is equal to P ( A ) . The plausibility of B ( without regard to A ) is equal to P ( B ) . The plausibility of B when A is true is equal to P ( B | A ) . ∴ The plausibility of A when B is true is equal to P ( A | B ) . P ( A | B ) = f ( P ( A ) , P ( B ) , P ( B | A ) ) . where Pr(A, B) represents the probability that propositions A and B are both true. In other words, this result, known as 'Cox's theorem', proved that the only acceptable way to quantify plausibilities P is to use probabilities, Pr, and that the central rule involved in considerations of plausibility is the formula for computing conditional probabilities, Bayes' rule. Readers interested in a more complete account of Cox's theorem are referred the excellent discussions by Jaynes  and more recently by Van Horn . 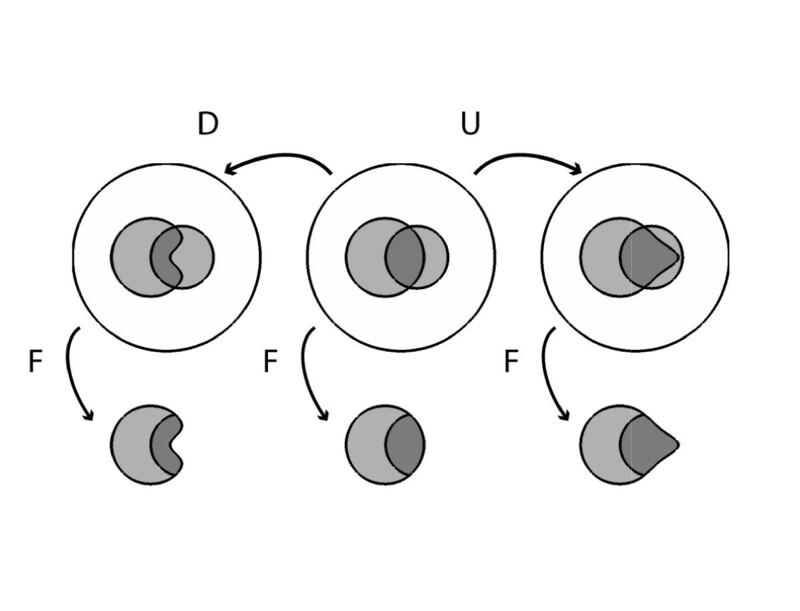 A brief review of the interpretation of each of the basic laws of probability theory, using Venn diagrams, can be found in the Additional file 1. P r ( A | B ) = P r ( B | A ) P r ( A ) P r ( A ) P r ( B | A ) + P r ( A ¯ ) P r ( B | A ¯ ) . This form is useful in that it makes explicit the fact that Bayes' rule involves three distinct ingredients, namely Pr(A), (and its converse P r ( A ¯ ) = 1 − P r ( A ) ) , Pr(B|A), and P r ( B | A ¯ ) . The meanings of these ingredients will become clear in the next section. We pause before proceeding to comment on our focus in this essay on simple applications of Bayes' rule. Our aim is to explain the basic concepts governing probabilistic inference, a goal we believe is best served by using very simple applications of Bayes' rule to evaluating mutually exclusive truth claims (that is 'binary hypotheses'). We hasten to add that binary hypothesis comparison is not necessarily always the best approach. For instance, in the quiz beginning this essay, rather than pitting H 0 ('no effect') against hypothesis H 1 ('some effect'), it may be more informative to consider a range of possible value for the strength of the effect, and to compute a probability distribution over this range of possible effect sizes, from which we could also 'read off' the credibility of the hypothesis that the effect size is equal to or close to zero. The perils of inappropriate uses of binary hypothesis testing, and alternative Bayesian methods for assessing hypotheses, are discussed at length in several good books and articles, for example [25, 26]. Indeed, much real-world medical reasoning cannot be naturally reduced to evaluating simple 'true/false' judgements, but requires instead the simultaneous analysis of multiple data variables, which often take on multiple or a continuous range of values (not just binary). There are frequently not just two but many competing interpretations of medical data. Moreover, we are often more interested in inferring the magnitude of a quantity or strength of an effect rather than simply whether a statement is true or false. Similarly, evaluating medical research typically involves reasoning too rich to be naturally modeled as binary hypothesis testing (contrary to the spirit of Fisher's famous pronouncement that 'every experiment may be said to exist only in order to give the facts a chance of disproving the null hypothesis' ). Similar points can be made about the richness of the inference characteristically required in much of everyday life. In principle, and increasingly in practice, these complex situations in fact can be given an appropriate quantitative probabilistic (that is 'Bayesian') analysis. Accordingly, we wish to make the reader aware that there exists large and expanding literature, built upon the foundation of Bayes' rule, which goes far beyond the simple considerations of binary hypothesis testing discussed here. To give just a few examples, Bayes' rule is the basis for: sophisticated methods for the rational analysis of complex data [26, 28, 29], especially data from medical clinical trials [30–36]; probabilistic models in cognitive science of sensory perception, learning, and cognition [20, 37–42]; and increasingly successful approaches to real-world problems in artificial intelligence including search engine technology, general pattern recognition in rich data sets, computer vision and speech recognition, terrorist threat surveillance, and early detection of disease outbreaks [19, 43–56]. Nevertheless, understanding the ongoing work at the frontiers of modern probability theory requires first a sound understanding of Bayes' rule in its most elementary form, the focus of this essay. It is important to appreciate that the interpretation of mathematical probability as a measure of plausibility, that is as a 'degree of belief', is not the only way of conceptualizing probability. Indeed, in mathematics probability theory is usually developed axiomatically, starting with the rules of probability as 'given' . Probability theory can also be developed from a 'frequentist' point of view, with probabilities interpreted as the fraction of events for which a particular proposition is true in series of cases over time, or within a collection or population of cases. The frequentist view has some obvious limitations in that it does not strictly allow one to talk about the probability of particular events, for example the probability that Mr. Jones has pneumonia. However, in practice the views are not incompatible: If we know nothing else about Mr. Jones, it may be reasonable to set one's initial assignment of the probability that Mr. Jones has pneumonia equal to the fraction of persons in similar circumstances who were ultimately found to have pneumonia. The interpretation of probabilities as degrees of belief is often called the 'subjective interpretation of probability,' or more succinctly, 'Bayesian probability,' because Thomas Bayes is credited as the first to develop a coherent way to estimate probabilities of single events . There is a long history of tension between the frequentist and Bayesian interpretations of probability. However, this controversy has waned, in part because of Cox's theorem, but also because of the explosion in the number of practical applications of Bayes' rule that have become possible since the computer revolution [19, 20, 53, 59, 60]. An intuition for why Bayes' rule has the form that it does can be gained by observing the effects produced by changing the values of each of its three variables. For concreteness, we frame our discussion in terms of the problem of distinguishing appendicitis from other causes of abdominal pain in a pediatric emergency department on the basis of the presence or absence of fever. In this example, fever is taken as evidence of appendicitis, so we have the following labels for the four possible combinations of fever (F) and appendicitis (A): (F, A) = 'true positives', ( F ¯ , A ¯ ) = ' true negatives ' , ( F , A ¯ ) = ' false positives ' , and ( F ¯ , A ) = ' false negatives ' . We note that Bayes' rule combines three essential ingredients: the prior probability of appendicitis Pr(A) (and its converse P r ( A ¯ ) = 1 − P r ( A ) ) and the two conditional probabilities Pr(F|A) and P r ( F | A ¯ ) , which we will call the true positive and false positive rates, respectively. The importance of each of the ingredients of Bayes' rule, the three arguments Pr(A|F) = f(a, b, c), where a = Pr(A), b = Pr(F|A), and c = P r ( F | A ¯ ) , is most easily grasped by considering extreme cases. We invite the reader to consider the arguments first from the standpoint of 'common sense' before checking that the conclusion is indeed borne out mathematically by Bayes' rule. Suppose that somehow we know, independent of fever status, that 100% of the patients have appendicitis, Pr(A) = 1. In this case, fever can have no effect on the probability of appendicitis, that is Pr(A|F) must be equal to Pr(A), regardless of the other two factors Pr(F|A) and P r ( F | A ¯ ) . Thus Pr(A|F) must depend on the prior probability, Pr(A). Next, suppose every child with appendicitis has a fever, Pr(F|A) = 1, and every child without appendicitis is afebrile, P r ( F | A ¯ ) = 0 . Then knowing the child's temperature would be equivalent to knowing the diagnosis. Thus, Pr(A|F) must be equal to one, and P r ( A | F ¯ ) must equal zero, regardless of Pr(A). Thus, Pr(A|F) must depend on some combination of the true positive rate, Pr(F|A), and false positive rate, P r ( F | A ¯ ) respectively. To see that Pr(F|A) and P r ( F | A ¯ ) can in fact act as independent variables in affecting Pr(A|F), for the next two cases, let our uncertainty before taking the child's temperature be maximal, P r ( A ) = P r ( A ¯ ) = 1 / 2 . Now suppose that all patients with appendicitis have fever, Pr(F|A) = 1. Then the predictive value of fever as a marker of appendicitis must vary inversely with the frequency of fever in patients without appendicitis, P r ( F | A ¯ ) (or equivalently, monotonically with the specificity P r ( F ¯ | A ¯ ) ). Thus, Pr(A|F) must depend on the true positive rate, Pr(F|A). Suppose that no one with appendicitis gets fevers, Pr(F|A) = 0. Then the presence of fever automatically rules out appendicitis, regardless of any other information. Thus, Pr(A|F) must depend on the false positive rate, P r ( F | A ¯ ) . These arguments show that the formula for the 'posterior probability', that is the probability of appendicitis given fever, Pr(A\F), must take into account all three quantities, Pr(A), Pr(F|A), and P r ( F | A ¯ ) , as indeed Bayes' rule does. We now explore how the output of Bayes' rule varies with its three inputs. Interactive online computer programs may also be helpful for gaining intuition, and can be found using the following references: [61, 62]. Consider a hypothetical population of 1,000 patients evaluated for abdominal pain in the pediatric emergency room, some with fever, some with appendicitis, some with both, and some with neither. We will systematically vary the proportions of each subpopulation and observe the output of Bayes' rule. The numbers used in these examples are summarized in Table 2. Hypothetical statistics for fever and appendicitis. P r ( A ) = ( T P + F N ) / ( T P + F P + F N + T N ) = 112 / 1 , 000 = 11 % . This situation is shown schematically in Figure 1 in which the area enclosed by the outer circle represents the entire patient population; the larger internal shaded region represents the number of patients with fever; the smaller internal shaded region represents the number of patients with appendicitis; and the area of overlap represents the number of patients with both appendicitis and fever. Reference population of patients with appendicitis and fever, showing the result of conditioning on the presence of fever. So, in a febrile child complaining of abdominal pain, what is the probability of appendicitis? Based on the information above, most physicians give an answer close to 56%, a conclusion reached apparently by mentally replacing the prior probability Pr(A) with the true positive rate Pr(F|A), thus confusing the latter with the correct quantity, Pr(A|F) [11, 12, 61]. The correct answer is computed by taking the fraction of patients with appendicitis among those with fever, Pr(A|F) = TP/(TP + FP) = 62/174 = 36%. 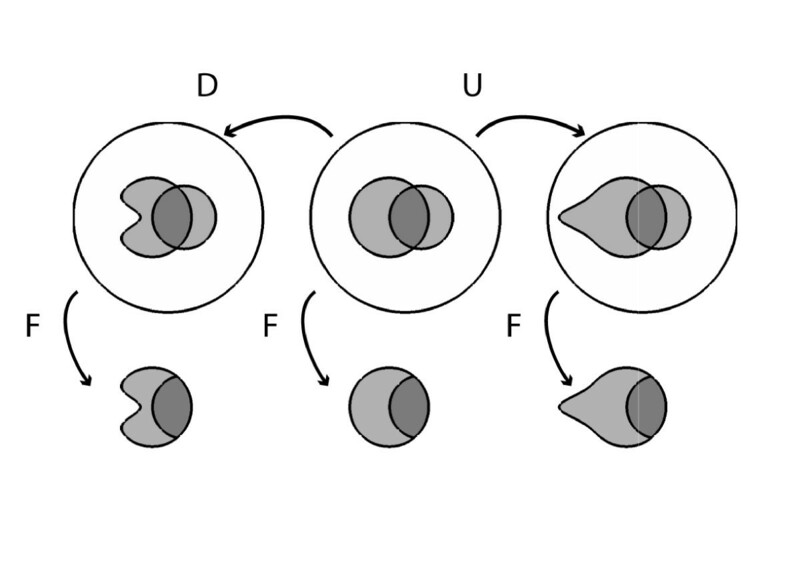 Figure 1 illustrates this calculation graphically, where the act of taking fever as 'given' is depicted as collapsing the population to just those patients who have fever. As expected, finding that a patient with abdominal pain has fever increases the probability of appendicitis - in fact, the probability more than triples (from 11% to 36%) - but, critically, the probability increases from the prior probability Pr(A). One needs to know the prior probability Pr(A) to calculate the posterior probability Pr(A|F). Suppose we increase the true positive rate Pr(F|A) from 56% to 71% (Figure 2). This increases the posterior probability of appendicitis from 36% to 41%. These increases correspond to an increase in the number of appendicitis patients who have fever from 62 to 79, or graphically to a 15% expansion of the part of the fever region that is within the appendicitis region, with the result that a 5% larger fraction of the fever region contains appendicitis. Conversely, a decrease in the true positive rate Pr(F|A) from 56% to 40% decreases the posterior probability Pr(A|F) from 36% to 29%. These changes correspond numerically to a decrease in the number of patients with fever and appendicitis from 62 to 45. Effects on posterior probability of changes in sensitivity, while holding prior probability and false positive rate constant. Next let us slightly increase the false positive rate P r ( F | A ¯ ) from 13% to 15% (Figure 3). This pushes the posterior probability Pr(A|F) down from 36% to 31%, and corresponds numerically to increasing the number of febrile patients without appendicitis from 112 to 136, or graphically to a 2% growth of the part of the fever region that is outside the appendicitis region, with the result that the fractional area of the fever region covered by appendicitis shrinks by 5%. Effects on posterior probability of changes in false positive rate, while holding prior probability and sensitivity constant. Conversely, a decrease in the false positive rate P r ( F | A ¯ ) from 13% to 10% pushes the posterior probability Pr(A|F) up from 36% to 41%. This corresponds numerically to decreasing the number of febrile patients without appendicitis from 112 to 88, or graphically to a shrinkage of the part of the fever region that is outside the appendicitis region by 3%, with the result that the fractional area of the fever region covered by appendicitis expands by 5%. Finally, consider increasing the prior probability of appendicitis Pr(A) from 11% to 25% while holding the true and false positive rates fixed at Pr(F|A) = 56% and P r ( F | A ¯ ) = 26 % . This change raises the posterior probability Pr(A|F) from 36% to 42%. 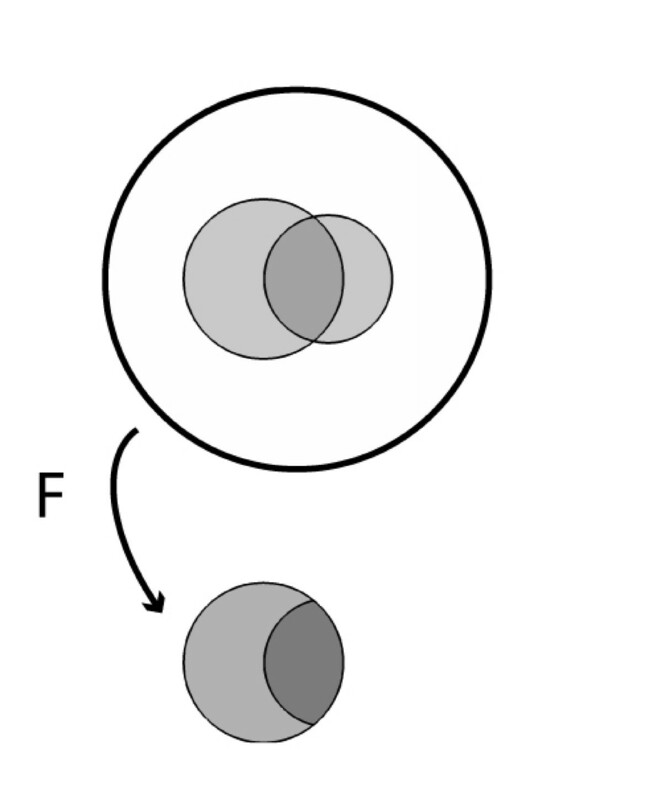 In the corresponding Venn diagram shown in Figure 4 increasing P(A) corresponds to simply increasing the area of A; Pr(F|A) is held fixed by increasing the area of F within A proportionately, whereas keeping the same value for P r ( F | A ¯ ) requires a compensatory shrinkage of the shape for F. Likewise, decreasing the prior probability from 11% to 4% lowers the posterior probability from 36% to 16%, which in the accompanying Venn diagram requires shrinking A, shrinking the part of F within A proportionately to hold Pr(F|A) fixed, and stretching the shape of F outside of A to maintain the fixed value of P r ( F | A ¯ ) . The numbers for this example are shown in Table 2 and Figure 4. Effects on posterior probability of changes in prior probability, while holding sensitivity and false positive rate constant. Increasing the true positive rate (sensitivity) pushes the posterior probability upward, whereas decreasing the true positive rate pushes the posterior probability downward. Increasing the false positive rate (1-specificity) pushes the posterior probability downward, whereas decreasing the false positive rate pushes the posterior probability upward. Increasing the prior probability pushes the posterior probability upward, whereas decreasing the prior probability pushes the posterior probability downward. We emphasize again that in every case the posterior probability goes up or down from the prior probability, rather than being replaced by any of the three quantities. 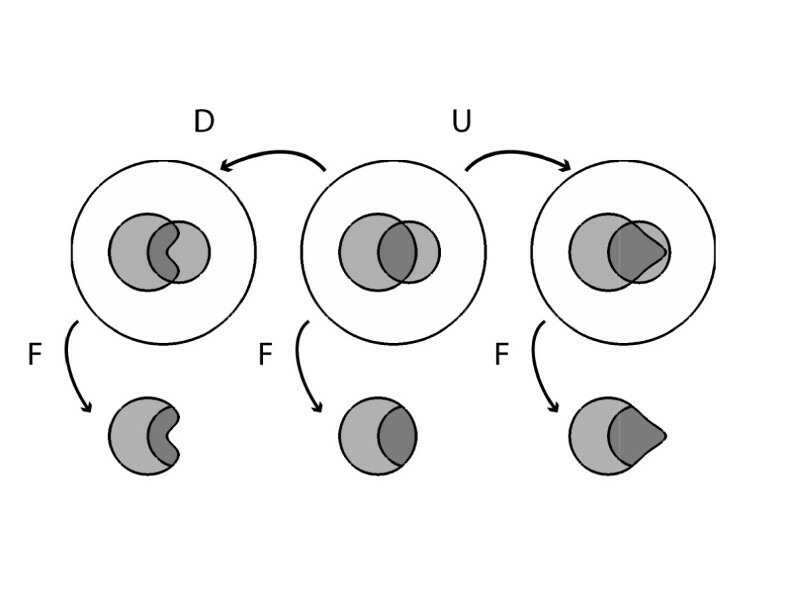 These general rules are illustrated in the graphs in Figure 5. 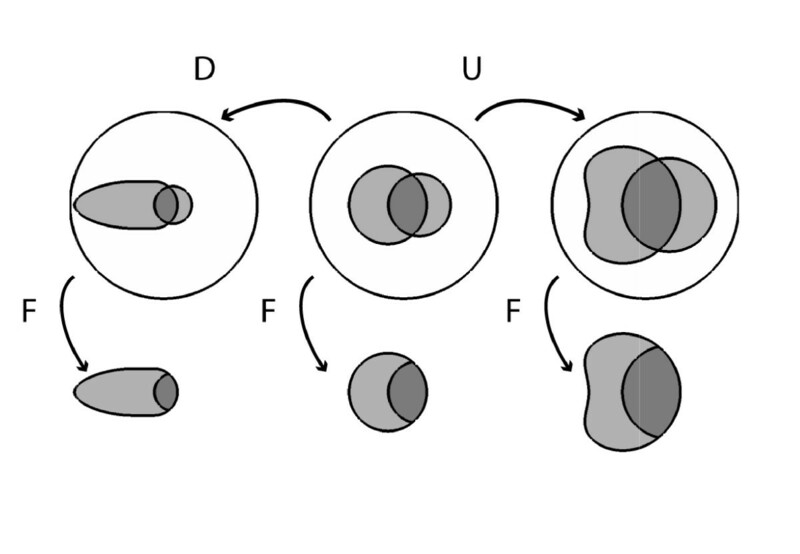 Illustration of how the posterior probability depends on the three parameters of Bayes' rule. Each plot shows two curves for the posterior probability as a function of one of the three parameters (with the remaining two parameters held constant) chosen from among one of two sets of values for(Pr(A), Pr(F|A), P r ( F | A ¯ ) ), either (0.3, 0.95, 0.05) or (0.1, 0.7, 0.15). Uncertainty suffuses every aspect of the practice of medicine, hence any adequate model of medical reasoning, normative or descriptive, must extend beyond deductive logic. As was believed for many decades, and recently proven by Cox and Jaynes, the proper extension of logic is in fact probability theory, with Bayes' rule as the central rule of inference. We have attempted to explain in an accessible way why Bayes' rule has its particular form, and how its behaves when its parameters vary. In the Part II, we investigate ways in which probability theory is commonly misunderstood and abused in medical reasoning, especially in interpreting the results of medical research. Armed with our understanding of the anatomy and physiology of Bayes' rule, we are prepared for pathophysiology. In Part II we explore common misinterpretations and misuses of elementary medical statistics that occur in the application of significance testing, and how these can be effectively treated by applying our understanding of Bayes' rule. Before one can appreciate the problems with significance testing, one needs a clear understanding of a few concepts from 'classical statistics', namely binary hypothesis testing and P-values. We now proceed to review these concepts. Binary hypothesis testing is familiar to most physicians as the central concept involved in judging the results of clinical trials. The basic setup was encountered in the quiz that began the paper. For any proposition A, we set up two hypotheses: H 0 = 'A is not true', called the null hypothesis; and H 1 = 'A is true', called the alternative hypothesis. In our quiz, the effect of a new drug was being investigated and we had H 0 = 'the drug has no effect' vs. H 1 = 'the drug has some effect'. One of these statements must be true as a matter of logical necessity. To find out which one, an experiment is carried out (for example a clinical trial), resulting in data D. We then conclude, through a procedure described below, that the data either favors H 0, called 'affirming the null hypothesis,' or favors H 1, called 'rejecting the null hypothesis.' We will denote our conclusions as either D 0 = 'the data favor the null hypothesis', or D 1 = 'the data favor the alternative hypothesis'. Our conclusions can be right or wrong in four ways (see Table 2). Correct results include 'true positives' (concluding D 1 when H 1 is true), and 'true negatives' (concluding D 0 when H 0 is true); the corresponding probabilities Pr(D 0 |H 0) and Pr(D 1 |H 1) are called the 'specificity' and 'power' of the study, respectively. Incorrect results include Type I errors (concluding D 1 when H 0 is true), and Type II errors (concluding D 0 when H 1 is true); the corresponding probabilities Pr(D 1 |H 0) and Pr(D 0 |H 1) are called the 'Type I error rate' and 'Type II error rate', respectively. There is a perfect analogy (and mathematically, no difference) between these probabilities and the 'four fundamental forward probabilities' well known to physicians in the context of diagnostic testing, namely, the true and false positive rates, and true and false negative rates. Similarly, corresponding to the 'four fundamental inverse probabilities' of diagnostic testing, namely positive and negative predictive values and the false detection rate and false omission rate, there are exactly analogous quantities for the hypothesis testing scenario, that is Pr(H 0|D 0), Pr(H 1 |D 1), Pr(H 0 |D 1), and Pr(H 1 |D 0). (See the Additional file 1 for a brief review of the fundamental forward and backward probabilities of diagnostic testing.) This analogy is summarized in Table 3 and has been expounded beautifully in a classic paper by Browner and Newman . We will return to this analogy near the end of the paper. The analogy between diagnostic tests and clinical trials. Let us now consider the conventional statistical reasoning process followed in drawing conclusions about experiments. This reasoning is prescribed by a standardized statistical procedure, the 'null hypothesis significance testing procedure' (NHSTP), or simply 'significance testing', consisting of the following steps. Specify mutually exclusive and jointly exhaustive hypotheses H 0 and H 1. Design an experiment to obtain data D, and define a test statistic, that is a number or series of numbers that summarize the data, T = T (D) (for example the mean or variance). Do the experiment, yielding data D, and compute the test statistic, T = T (D). Compute the P-value of the data from the test statistic, P = P (T (D)). Compare the P-value to the chosen significance level. If P ≤ α, conclude that H 1 is true. If P > α, conclude that H 0 is true. In the customary statistical jargon, when P ≤ α, we say that the experimental results are 'statistically significant', otherwise, they 'do not reach significance.' Also, note that the P-value itself is a statistic, that is a number computed from the data, so in effect we compute a test statistic T = T (D), from which we compute a second test statistic P = P (T(D)). the probability that the data (that is the value of the summary statistic for the data), or more extreme results, could have occurred if the intended experiment was replicated many, many times, assuming the null hypothesis is true. The potential morass created by this definition can be illustrated by imagining that an experimenter submits a set of data, consisting, say, of 23 data samples, to a statistical computer program, which automatically computes a P-value. According to the definition above, to produce the P-value, the computer must implicitly make several assumptions, often violated in actual practice, about the experimenter's intentions, such as the assumption that there was no intention to: collect more or less data based on an analysis of the initial results (the 'optional stopping problem'); replace any lost data by collecting additional data; run various conditions again; or compare the data with other data collected under different conditions [26, 28, 75]. Any of these alternative intentions would leave the actual data in hand unaltered, while implicitly altering the null hypothesis, either trivially by changing the number of data points that would be collected in repeated experiments, or by more profound alterations of the precise mathematical form of the probability distribution describing the null hypothesis. Consequently, the P-value apparently varies with the unstated intentions of the experimentalist, which in turns means that, short of making unjustified assumptions about those intentions, the P-value is mathematically ill defined. the probability under the null hypothesis of obtaining the same or even less likely data than that which is actually observed, that is the probability of obtaining values of the test statistic that are equal to or more extreme than the value of the statistic actually computed from the data, assuming that the null hypothesis is true. Note that this definition does not include any reference to the 'intentions' under which the data were collected. To avoid any possible confusion, we emphasize that this definition requires that the null hypothesis, H0, be fully specified. This means, for example, that the number of data samples n, constituting the data D, the chosen data summary statistic T (D), and more generally a mathematical formula for the probability distribution of values for the data summary statistic under the null hypothesis, Pr(T (D)|H0), be explicitly stated. In some cases, this specification is straightforward. For example, if the data is assumed to follow a normal distribution, then the null hypothesis can be fully specified by simply stating values for two parameters, the mean and standard deviation. In other cases the distribution can have a mathematically complicated form. Methods for specifying and computing complex null hypotheses are beyond the scope of this essay, but have been well worked out in a wide variety of practically important cases, and are in wide use in the field of statistics. The important point to grasp here is that once the null hypothesis H0, is specified, or more precisely, the relevant probability distribution Pr(T (D)|H0), then computing the P-value can in principle proceed in a straightforward, uncontroversial manner, according to its mathematical definition given above. As mentioned above, without specifying the null hypothesis distribution explicitly, the P-value is ill-defined, because any raw data are generally consistent with multiple different possible sample-generation processes, each which of may entail a different P-value [25, 26]. We now turn to explaining our final, technical definition of the P-value. We will do this by exploring the definition from the vantage point of three different examples. The third example presents an additional, alternative definition of P-values which provides novel insights into the true meaning of P-values by viewing them from the medically familiar perspective of sensitivity and specificity considerations, in the context of ROC curves. This final definition will be mathematically equivalent, though not in an immediately obvious way, to the definition just given. Graphically, a P-value can be depicted as the area under one or two tails of the null-hypothesis probability distribution for the test statistic, depending on the details of the hypothesis being tested. For example, consider the classification of patients' systolic blood pressure as either chronically hypertensive, H 1, or not chronically hypertensive, H 0, on the basis of a single blood pressure measurement. Let us assume that blood pressures for normotensive patients obey a normal distribution N ( B P ) , as shown in Figure 6. If for a particular patient we obtain a systolic blood pressure of SBP = 138.6, then the P-value for this result is the probability in a non-hypertensive patient of finding a blood pressure equal to or greater than this value, or the area under the right sided tail of N ( B P ) , starting from SBP = 138.6. Distribution of systolic blood pressures for a population of healthy 60-69 year old males (from data in ). 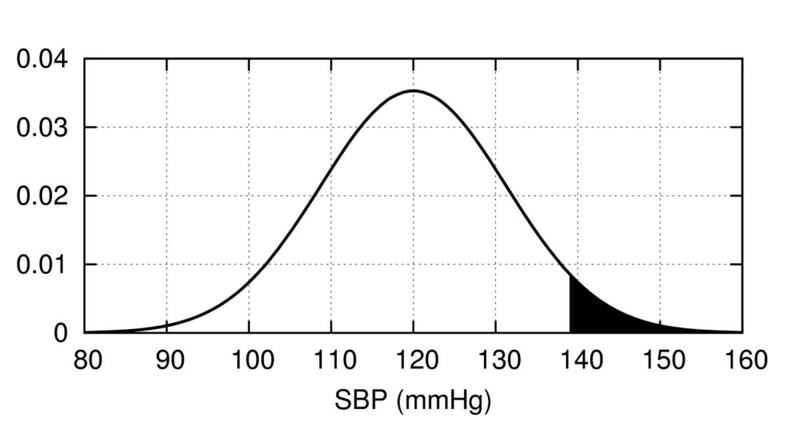 The value SBP = 138.6 mmHg has a P-value of 0.05, equal to the shaded area under the curve. If instead the null hypothesis states that the patient is chronically normotensive, H 0, so that the alternative H 1 includes the possibility of either hypertension or hypotension, then the P-value would be 'two-sided', since values under an equally-sized left sided tail of the distribution would be equally contrary to the hypothesis H 0 and hence would have caused us to reject H 0 according to the null hypothesis significance testing procedure (NHSTP). Let H 0 = 'the probability of heads is 1/2', H 1 = 'probability of heads ≠ 1/2'. The experiment will consist of flipping a coin a number of times n, and the data D will thus be a series of heads or tails. For our test statistic T , let us compute the difference between 1/2 and the fraction of heads, that is if k of the n coin tosses land as heads, then T (D) = |1/2-k/n|. For this example, let us put n = 10. We set the significance level to the conventional value α = 0.05 = 5%. Having done the experiment suppose we get data D = (H, H, H, H, H, H, T, H, H, T). This sequence contains eight heads, so T (D) =|1/2-8/10| = 0.3.
p = P r ( T ( D ) ≥ 0.2 | H 0 ) = P r ( k ≥ 8 or k ≤ 2 | H 0 ) = 10.94 % . Since p ≥ 5%, the NHSTP tells us to accept the null hypothesis, concluding that the coin is fair. Before leaving this example, it is instructive to examine its associated Type I and II error rates. The Type I error rate (false positive rate) in this case is the probability of incorrectly declaring the coin unfair (H 1) when in fact it is fair (H 0), that is, the probability of getting P ≤ α when in fact H 0 is true. It turns out that had we observed just one more head then the NHSTP would have declared a positive result. That is, suppose k = 9, or T (D) = |1/2 - 9/10| = 0.4.
p = P r ( T ( D ) ≥ 0.4 | H 0 ) = P r ( k ≥ 9 or k ≤ 1 | H 0 ) = 2.15 % . F P R = P r ( D 1 | H 0 ) = P r ( p ≤ α | H 0 ) = 2.15 % . the minimum false positive rate (Type I error rate) at which the NHSTP will reject the null hypothesis. Though not obvious at first glance, this definition is mathematically equivalent to our previous definition of the P-value as the probability of a result at least as extreme as the one we observe. The effort required to see why this is the case affords additional insight into the nature of P-values. F P R ( γ ) = P r ( d ≥ γ | H 0 ) , T P R ( γ ) = P r ( d ≥ γ | H 1 ) . ROC curve for the coin flipping experiment with n = 10, H 0 : Pr ( Heads ) = 0.5 vs.H 1 : Pr ( Heads ) = 0.7. The curve is generated by varying a threshold between 0 (corresponding to the point (1, 1)) and 10 (corresponding to the point (0, 0)). 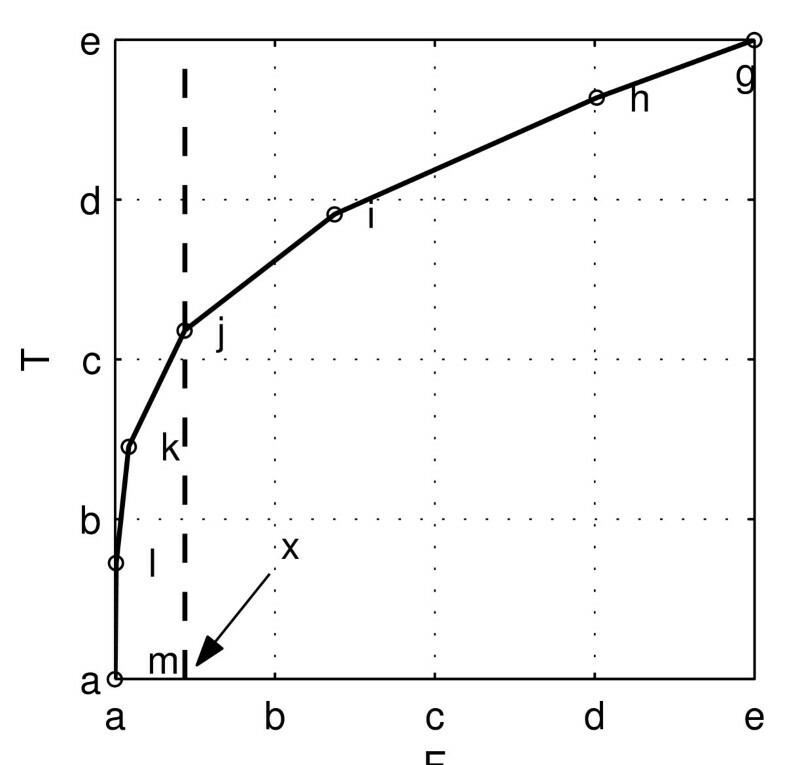 Key points on the ROC curve are marked by circles, and the corresponding value for is γ noted. Points on the ROC curve 'down and to the left' (low false positive rate, low true positive rate) correspond to setting the threshold low; whereas values 'up and to the right' (high false positive rate, high true positive rate) correspond to setting the threshold high. Clearly, if we wished to avoid all false positive conclusions, we could set the threshold to -∞, since all results will then be declared negative (Pr(d ≤ -∞|H 0) = 0), but this comes at the expense of rejecting all true positive results as well (since Pr(d ≤ -∞|H 1) = 0). Conversely, we can avoid missing any true positive results by setting the threshold to γ ≤ 0.5, since it is true for all possible results that d ≤ 0.5 (hence Pr(d ≤ 0.5|H 1) = 1), but this simultaneously results in a maximal false positive rate (since Pr(d ≤ 0.5|H 0) = 1 also). Clearly, positive results are only meaningful when obtained with the threshold γ set to some value intermediate between these extremes. Now, suppose that after conducting our coin flipping experiment we decide to 'cheat' as follows. As before let the outcome be that we get eight heads, or d = |1/2 - 8/10| = 0.3. Rather than choosing the decision threshold beforehand, we instead choose the threshold after seeing this result, to ensure that the result is declared positive. Our results will look best if we choose the threshold γ as small as we can, to let through as few false positives as possible, while still letting our result pass. This special choice of the threshold γ is clearly the value of our actual result, so we set γ = d = 0.3, and voilà, our result is positive. We cannot make the false positive rate any smaller without making our result negative according to the NHSTP. If A is true, then B is probably true . B is false . ∴ A is false . If H 0 is true, then probably P > α . p ≤ α . ∴ H 0 is false . If H 0 is true, then probably P > α . P ≤ α . ∴ H 0 is probably false . P r ( H 1 D 1 ) = ( .80 ) ( .01 ) ( .8 ) ( .1 ) + ( .99 ) ( .2 ) = 7.8 % . To put it as alarmingly as possible, the probability that she has breast cancer has increased by almost 8 fold! Nevertheless, she probably does not have cancer (7.8% is far short of 50%); the odds are better than nine to one against it, despite the positive mammogram. Thus, while further testing may be in order, a rational response is reassurance and perhaps further investigation rather than pronouncement of a cancer diagnosis. This and other examples familiar from everyday clinical experience make clear that the null hypothesis significance testing procedure cannot 'substitute' for Bayes' rule as a method of rational inference. We have focused our criticism on what we consider to be the most fundamental and most common error in the interpretation of P-values, namely, the error of mistaking 'significant' P-values as proof that a hypothesis is 'probably true'. There are many other well documented conceptual problems with P-values as commonly employed which we have not discussed. The interested reader is referred to the excellent discussions in the following references [7, 28]. The answer to the quiz at the beginning of this paper is plain from the preceding discussion. Given a P-value that reaches significance (such that the NHSTP would have us conclude that H 1 is true), what conclusions are we actually justified in drawing regarding the probability that either hypothesis H 1 or H 0 is true? Answers (1), (2), and (5) are incorrect because the NHSTP, which corresponds to the 'hard' version of 'probabilistic proof by contradiction' is an invalid argument. Answers (3), (4), and (6) are invalid because the 'softened' version of the same argument is still invalid. To determine the probability that H 1 is actually true in light of the positive result D 1 = 'P < α', that is, to calculate Pr(H 1 |D 1), Bayes' rule requires that we have three pieces of information. First, we need the false positive rate, which as we have seen for the NHSTP is Pr(D 1 |H 0) = Pr(P ≤ α|H 0) = α; this is the only piece of information we were given in the quiz question. Second and third, however, we need to know the 'power' (sensitivity) of the study, Pr(D 1|H 1), and the pre-test probability of the hypothesis, Pr(H 1). Thus, the correct answer is '(7) None of the above'. Do prior probabilities exist in science? The big difference between a study and a clinical test is that there is no real way of knowing how likely or unlikely a hypothesis is a priori. In order to have a predictive value in a clinical test, you need a prevalence or pre-test probability. This does not exist in science. It is the job of the scientist to convince us that the pre-test probability is reasonably high so that a result will be accepted. They do this by laying the scientific groundwork (introduction), laying out careful methods, particularly avoiding bias and confounders (methods), and describing the results carefully. Thereafter, they use the discussion section to outright and unabashedly try to convince us their results are right. But in the end, we do the positive predictive value calculation in our head as we read a paper... As an example, one person reads the SPARCL study and says, 'I do not CARE that the P-value shows statistical significance, it is hooey to say that statins cause intracranial hemorrhage.'... They have set a very low pre-test probability in their head. Another person reads the same study and says, 'I have wondered about this because I have seen lots of bleeds in people on statins.' They have set a much higher pre-test probability. This response actually makes our point, perhaps inadvertently, about the necessity of prior probabilities. Nevertheless, several important points raised by this response warrant comment. Do prior probabilities 'exist' in science? First, to the philosophical question of whether prior probabilities 'exist' in science, the answer is 'yes and no'. On the one hand, probability theory is always used as a simplifying model rather than a literal description of reality, whether in science or clinical testing (with the possible exception of probabilities in quantum mechanics). Thus, when one speaks of the probability that a coin flip will result in heads, that a drug will have the intended effect, or that a scientific theory is correct, one is not necessarily committing to the view that nature is truly random. In these cases, the underlying reality may be deterministic (for example a theory is either true or false), in which referring to probabilities represents merely a convenient simplification, but do not really 'exist' in the sense that they would not be needed in a detailed, fundamental description of reality. However, simplification is essentially always necessary in dealing with any sufficiently complex phenomena. For example, while it might be possible to conceive of a supercomputer capable of predicting the effects of a drug using detailed modeling of the molecular interactions between the drug and the astronomical number of cells and molecules in an individual patient's body, in practice we must make predictions with much less complete information, hence we use probabilities. The use of such simplifications is no less important in scientific thinking than in medical diagnostic testing. Thus, insofar as probabilities 'exist' at all, they are not limited to the arena of diagnostic testing. Are prior probabilities in science arbitrary? Given that prior probabilities for hypotheses in science and medicine are often difficult to specify explicitly in precise numerical terms, does this mean that any prior probability for a hypothesis is as good as any other? There are at least two reasons that this is not the case. First, pragmatically, people do not treat prior probabilities regarding scientific or medical hypotheses as arbitrary. To the contrary, they go to great lengths to bring their probabilities into line with existing evidence, usually by integrating multiple information sources, including direct empirical experience, relevant theory (for example an understanding of physiology), and literature concerning prior work on the hypothesis or related hypotheses. These prior probability assignments help scientists and physicians choose which hypotheses deserve further investment of time and resources. Moreover, while these probability estimates are individualized, this does not imply that each person's 'subjective' estimate is equally valid. Generally, experts with greater knowledge and judgement can be expected to arrive at more intelligent prior probability assignments, that is their assignments can be expected to more closely approximate the probability an 'ideal observer' would arrive at based on optimally processing all of the existing evidence. Second, in a more technical vein, methods for estimating accurate prior probabilities from existing data are an active topic of research, and are likely to lead to increased and more explicit use of 'Bayesian statistics' in the medical literature [29, 31–36, 83, 89]. Finally, regarding the responsibility of scientific authors and readers to take prior probabilities seriously: We emphatically agree that authors should strive to place their results in context, so as to give the firmest idea possible of how much plausibility one should afford a hypothesis, prior to seeing the new data being presented. Without this context, there is no way to appraise how likely a hypothesis is to actually be true, or how strong the evidence needs to be to be truly persuasive. The neglect of thorough introductory and discussion sections in scientific papers is decried by many as a natural side effect of reliance on significance testing arguments [7, 90, 91], and is blamed for the too-common phenomenon of unreproducible results in clinical trials [92–97], and has even lead some authors to suggest that the majority of published medical research results may be false [5, 98–100]. Similarly, it is a central thesis of this paper that in reading the medical literature physicians should strive to take prior probabilities into account. Indeed, taking prior probabilities into account can be viewed as a good summary of what it means to read the medical literature critically. Has significance testing been perverted? ...no test based upon a theory of probability can by itself provide any valuable evidence of the truth or falsehood of a hypothesis. . . But we may look at the purpose of tests from another viewpoint. Without hoping to know whether each separate hypothesis is true or false, we may search for rules to govern our behavior with regard to them, in following which we insure that, in the long run of experience, we shall not often be wrong . Thus, Neyman and Pearson apparently did not intend hypothesis testing to be used as it usually is used nowadays, as a method for appraising the truth of individual hypotheses. Rather, their method was intended merely to be correct in an aggregate sense. While this may be acceptable, say, to decide the fates of mass-produced objects in an industrial setting, it is unsatisfactory in medical situations involving individuals. There, it is imperative that we strive to be right in each case. Similarly, few researchers would be content to use a method of inference realizing that it cannot accurately appraise the truth of the individual hypotheses. While significance testing does not provide a way to know 'whether each separate hypothesis is true or false', fortunately Bayes' rule does provide rational grounds for appraising the strength of evidence in favor of individual hypotheses. How significant is a significant result? If it is unjustified to regard a 'statistically significant' result as sufficient evidence for the truth of a hypothesis, then what can we conclude when we read 'P ≤ α'? How much evidence does a statistically significant result provide for its hypothesis? The fact is that the amount of evidence provided by a P-value depends on the prior probability and power of the research methodology, in the way prescribed by Bayes' rule. Thus, there is no generic value of P that will render a hypothesis more likely true than not (that is Pr(H 1 |P ≤ α) > 50%). Rather, the true 'significance' of P varies from case to case, in the same way as the meaning of a BNP value varies according to a patient's clinical characteristics when evaluating for suspected congestive heart failure (see Additional file 1 Figure S1) [102, 103]. 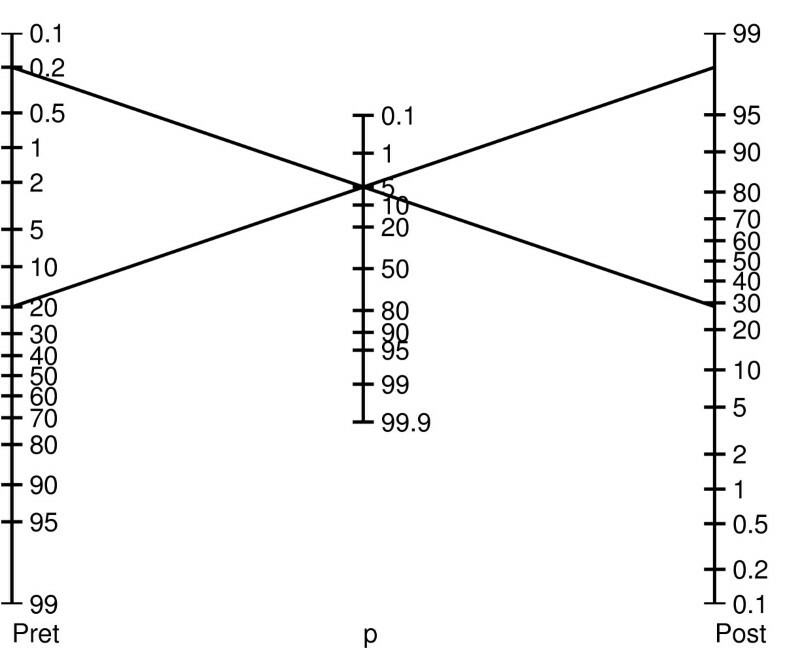 It is helpful conceptually when assessing P-values to envision a 'P-value nomogram', as illustrated in Figure 8. As shown, a P-value of 0.05 can lead to very different posterior probabilities. Note that the particular nomogram shown is not universal; it was calculated by assuming specific distributions for H 0 and H 1. But the basic idea that the degree of support for a hypothesis provided by a P-value depends on the pre-test probability is general. Bayesian P -value nomogram for a hypothetical hypothesis testing problem. This nomogram is calculated assuming normal distributions for the null hypothesis H 0 and the alternative hypothesis H 1, with variance equal to one, and means differing by a value of two. Probability theory was regarded by its early architects as a model not only for how educated minds should work, but for how they do actually work. This 'probabilistic theory of mind' forms the basis for modern views on the nature of rationality in philosophy, economics, and more recently in neuroscience [104–108]. How can this be, when there is widespread misunderstanding of the most basic of statistical concepts like P-values and significance testing, even among a group as educated and accustomed to consuming statistical data as physicians? We briefly consider arguments for and against the possibility that physicians are, or can be, good Bayesians. The most serious challenge to the probabilistic theory of mind is the 'heuristics and biases' movement of experimental psychology, started by a series of influential papers published in the late 1960 s and early 1970 s by Kahneman and Tversky [109, 110]. The central claim of this movement is that people tend to make judgements under uncertainty not according to Bayes' rule, but instead by simplifying rules of thumb (heuristics) that, while convenient, nevertheless often lead to systematic errors (biases). With respect to medical reasoning, we can roughly categorize the types of biases by whether they affect one's clinical estimates of prior or posterior probabilities. Physicians' estimates of the prior probability of disease may vary wildly [10, 111, 112]. For example, given the same vignette of the history, physical exam, and EKG for 58 year old female with chest pain, physicians were asked to assign probabilities to various diagnoses including acute myocardial infarction (AMI), aortic dissection, and gastroesophageal reflux. Estimates for AMI ranged from 1% to 99%, and the probabilities assigned by many physicians surveyed added to greater than 100% . Two classic examples of cognitive biases that contribute to this variability are the representativeness and availability biases. This is the tendency to violate the old medical maxim, 'when you hear hoofbeats, think horses, not zebras.' That is, the tendency to set the prior probability inappropriately high for rare diseases whose typical clinical presentation matches the case at hand, and inappropriately low for common diseases for which the presentation is atypical. This bias leads to overdiagnosis of rare diseases. Also called the 'last case bias' in the medical context, this is the tendency to overestimate the probability of diagnoses that easily come to mind, as when, having recently seen a case of Hashimoto's encephalopathy, one automatically suspects this first in the next patient who presents with confusion, a relatively nonspecific sign. Another example is doubting that smoking is harmful because one's grandmother was a smoker yet lived to age ninety. Other studies have explored ways in which physicians deviate from Bayes' rule in updating prior probabilities in light of new data [113, 114]. Well known examples of responsible underlying cognitive biases are the anchoring, confirmation, and premature closure biases. This is the tendency to set one's posterior probability estimate inappropriately close to a starting value, called an anchor. Errors can arise from anchoring to an irrelevant piece of information (as when patients are sent home from the low-acuity part of the emergency department who would have been admitted from the high-acuity part), or by generally undervaluing new information when it does not support one's initial impression. Also known as belief preservation, hypothesis locking, and selective thinking, this is the tendency maintain one's favored hypothesis by overvaluing and selectively searching for confirmatory evidence and undervaluing or ignoring contradictory evidence. Reasons for this bias include vested emotional interest, for example as when avoiding a potentially upsetting diagnosis, or inconvenience, for example as when downplaying medical symptoms in a patient with challenging psychiatric problems. This is the tendency to make a diagnosis before sufficient evidence is available. Premature closure bias can arise from emotional factors such as discomfort over a patient's or the physician's own uncertainty, or because of time pressure [113, 114]. The heuristics and biases movement notwithstanding, the probabilistic theory of cognition has been resurrected in recent years in the fields of neuroscience, artificial intelligence, and human cognitive science. As mentioned earlier, Bayesian theories have provided successful explanations of the sub- or pre-conscious mental phenomena, such as learning , visual object and pattern recognition [45, 116], language learning and speech recognition [38, 41]; and memory . In the artificial intelligence community, there is a general consensus that many difficult engineering problems are best formulated and solved within a probabilistic framework, including computer vision, speech recognition, search engine technology, and pattern recognition, [43, 44, 46–48, 50, 51, 53]. Similarly, Bayesian inference has become the generally accepted framework for understanding how the nervous system achieves its feats, yet unmatched by engineering technology, of visual and auditory perception, among other tasks [104, 108, 117–119]. The thread tying these various problems and fields together is the need to draw rich inferences from sparse data, that is, to reason under uncertain conditions where the required conclusions are underdetermined by the available evidence. There is also a growing consensus that many higher-level human cognitive processes also operate on Bayesian principles [20, 39, 40]. Specific examples include studies of human symbolic reasoning , reasoning about and predicting the actions of other people , and estimating various everyday quantities . Taking this last example as a case in point, Tenenbaum et al. recently studied the abilities of subjects to predict the values of uncertain quantities that arise in everyday reasoning situations. Subjects were told how long a particular everyday process had been going on so far (for example how long a cake had been baking, or how long a man had lived so far), and were asked to predict the final value of the process (for example how much longer before the cake will be done baking, or when the man will die). The scenarios tested included total final profits for movies, total runtimes of movies, the length's of poems, term lengths for US representatives, and cake baking times. In these tasks, people's judgements are remarkably close to optimal Bayesian estimates. These findings suggest that in many everyday tasks at which people are 'experts', people implicitly use the appropriate statistical distributions and, albeit unawares, carry out optimal probabilistic calculations. How can the view that in many situations people perform Bayesian inference be reconciled with findings from the Heuristics and Biases movement (and our quiz results), showing that most people understand the elementary concepts of probability and statistics poorly at best? In large part, the answer is that fluency with statistics and probability theory at a formal level need not cast doubt on Laplace's claim that 'good minds' use probability theory by 'a sort of instinct'. Thus, although physicians are vulnerable to the traps of experimental psychologists in tests of formal verbal reasoning about probability and statistics, nevertheless physicians are adept at managing uncertainty. We suspect that studies similar to that of Tenenbaum et al. will ultimately show that, when dealing with uncertain situations they encounter often, good physicians frequently are much better Bayesians than the Heuristics and Biases movement gives them credit for. Until recently, the art of medical reasoning has arguably gotten along well enough with little formal understanding of mathematical probability. This has been possible largely because, as Laplace observed, at some informal, implicit level, the everyday reasoning of good minds conforms to the laws of probability. However, physicians can no longer afford the luxury of complete informality. Without a solid understanding of basic probability, one can no longer intelligently interpret the medical literature. The quiz results that began this essay are a sobering reminder that most physicians still lack understanding of elementary probability and statistics. In particular, it is worrisome that physicians seem to so easily fall prey to the illusion that significance testing allows one to evaluate the truth of a hypothesis without having to take into account contextual information like prior studies and biological plausibility. Like others we are concerned that the increasing use of statistics without a parallel increase in statistical literacy renders the medical literature at risk for becoming less scientific [7, 90, 91, 123, 124]. Nevertheless, all statistical argumentation ultimately boils down to the basic question answered by Bayes' rule: In what way should one's confidence in a particular claim change in response to new data? Thus, a deeper appreciation of Bayes' rule may go a long way toward making physicians less vulnerable to the fallacies inherent in conventional applications of statistical significance testing. null hypothesis significance testing procedure. Thanks to the medical residents and faculty members at Brigham and Women's Hospital, Massachusetts General Hospital, and Barnes Jewish Hospital who participated in the quiz. The authors also gratefully acknowledge Emily J Westover, PhD, and Sydney Cash, MD, PhD, and the reviewers for critical comments on earlier versions of the manuscript. A zero difference between the three authors' contributions to this work is among the credible values.